Were The Americas Settled Twice? A team of paleoanthropologists report in PLoS One analyzed the skulls of several dozen 11,000 year old Paleoamericans and compared them to the skulls of more than 300 1,000 year old Amerindians. They concluded that based on the morphology, there were two distinct waves of colonizers from Asia. While we know from a couple genetic studies there are at least two, if not 3 or more waves of colonizers, the morphological evidence is now beginning to make a lot more sense along with the genetic evidence. There’s some concern why the authors didn’t have more North American and Asian samples for comparison, but that’s almost always a critique in any anatomical study. I’ve found your article on various migrations into the Americas most interesting. As usual, it raises more questions in my mind than it answers. One of my favorites is the constantly changing “mother culture” of the Americas. As I recall, there was some question about the ethnicity of the Chachapoya vs. other native “indians”. I know this question arises periodically ref the Olmec (african? phillipino? ??). 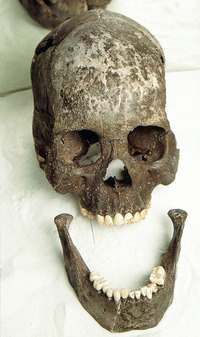 Well, it seems that (again) the anthropometrical analysis of skulls are probably wrong: a new paper by Perego et al., expands part of the mitochondrial genetic data of Native Americans appears to resolve the matter in favor of a single colonization most likely, a colonization that expanded from Alaska to the South Cone in less than one thousand years, somewhere between 15 and 18 Ka. ago. I briefly discuss it here. If you scholars know anyone who’s looking for articles to study from directly about South Texas culture visit http://thew0lf.wordpress.com/ I live in South Texas and most of my text is focused on the issues here in South Texas. Issues such as drugs, or the situation a lot of Mexican immigrants face when they get university degrees in their home country and come across only to find out their degree is of no value. Language barrier, sexual behavior, religion of south texas. This area is really interesting and has so much history that I hope more people start studying about it. As far as proof for multiple immigrations to the Americas is concerned, language can also be considered as well as genetics and morphological analyzation. I believe there are two distinct language families in the Americas that cannot be well related to each other. These could have evolved from the languages from two waves of people immigrating to the Americas. obviously the academics leave out both the migration and emergence stories by the “people” handed down for time immemorial..i guess if it isn’t written down in some text book penned by a some euro-centric egghead with an agenda ,some footnotes and a box full of our ancestors remains to study. its only an unverifiable a myth with no credibility..
i remember that the idea had already been there had been two migratione events? even if they had for climatological reasons been in relatively short timespan, like say 1000 years, and that at least part of that theory was based on tool industry evidence? i am not anymore sure, maybe it was skulls. i was kind of surprised to find no reference to it in the discussion here. also i think the last comment is right, there were quite many visitors in the americas before columbus. eg the phoenician ship covered up in the ‘columbus year’, even that is not unique.